We are distributors of All Brembo Products, Please see links below to our other secure website, One Stop Moto - This has a much stronger focus on branded motorcycle accessories. Here you can easily navigate and securely place an order direct. If you prefer you can email us: sales@spengineering.co.uk or call us with your requirements on 01373 474740. You cannot talk about Brembo without mentioning racing. Even though many production bikes are fitted as standard equipment with Brembo products, all of them start from the test bed that is racing. From Formula 1 to Moto GP and Superbike, in every racing class Brembo has succeeded in its goal to win. They are without doubt the worlds most successful name in motorcycle brakes. They have won almost every race series in the world worth winning and in Moto GP, the toughest motorcycle series in the world, to date, no other manufacturer has won a single race! 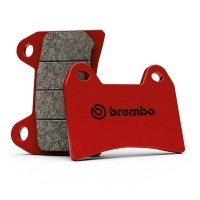 The Sintered Road Pads are Brembo's most popular aftermarket pads. The new SA (front) and SP (rear) sintered compounds are excellent for the latest generation sports bikes. 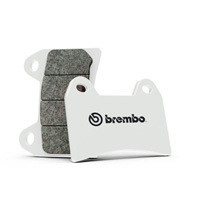 Manufactured through a particular production process, these brake pads have a high friction coefficient, excellent initial bite and are superb in both wet and dry weather for fast road use. These are an excellent alternative to Original Equipment pads! A sintered compound intended specifically for road bikes, typified by particularly good efficiency under all operating conditions. Similar to Brembos highly popular SA sintered pads but last around 30% longer than its predecessor, and still offering the same performance! The new Brembo Replacement disc programme makes Brembo quality available to everyone for the first time, from scooters to superbikes. Developed very much from racing, they are manufactured to all original dimensions and are designed to directly replace and improve upon your original units. They use Brembo high carbon stainless steel rotors, heat treated light alloy centres and the two attach together with spring loaded Brembo floating bobbins. They are available in both front and rear fitments for most modern motorcycles. Most front discs models use 5mm thick rotors for improved performance and durability, and they can be used with all other original equipment parts as well as the Brembo brake pad programme. 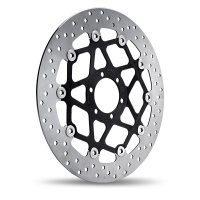 You simply cannot buy a better replacement disc for your motorcycle!